Cushion has several different views for time-tracking. Whether you track throughout the day, tally hours at the end of the week, or prefer the accuracy of a timer, Cushion can adapt to your workflow. The most detailed view is the day view, which lets you focus on a single day and draw your time. By default, Cushion starts you off in the day view, but you can switch between the different views using the toggle on the bottom-right of the graph. When you hover the day graph, Cushion will display the time where your cursor is located. By clicking and dragging your cursor, you can draw a new time entry. If you hold the shift key while dragging, Cushion will snap the time entry to the nearest 15 minutes. 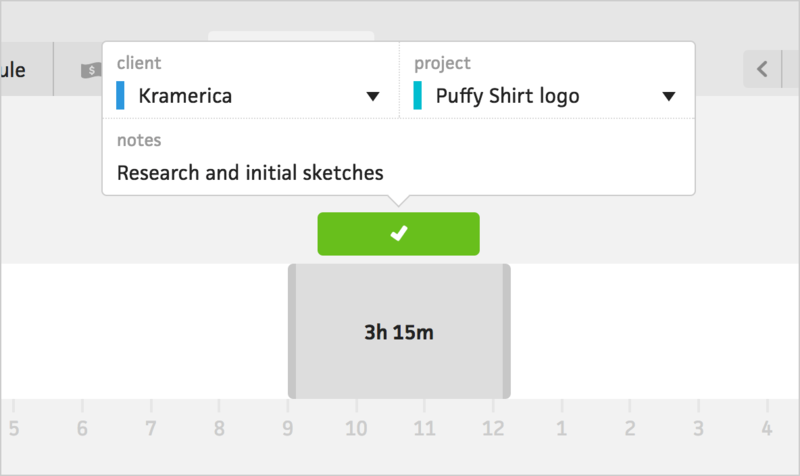 Once you release your cursor, Cushion will display an inline form, so you can specify the time entry's client, project, and any notes about the completed work. Cushion will remember your last time entry’s client and project, so when you’re entering several time entries for a single project, you can create them quicker. After creating the time entry, it will fade into the project or client’s color. You can hover a time entry to display its client, project, and duration. If you’re the type of person who likes to drag and drop, in the day view, you can move or resize a time entry to edit its start and end times. After interacting with a time entry, Cushion will display a confirmation prompt, so you have the chance to revert to the previous size and position. If you prefer to track time over the course of the week instead of zoomed in on a day, you can switch to the week view. In the week view, time is stacked vertically. Cushion will display the days of the week based on your start week on preference. To add time in the week view, hover a day and a button will appear at the top. Clicking the button will display an inline form like in the day view. In the week view, however, when adding time, Cushion doesn’t retain the start or end time—only the duration. This is intended for people who simply need to know their hours at the end of the day—not when the hours were spent. When specifying the hours, you can either enter an amount, drag the clock icon, or use the up and down arrows on your keyboard. When holding shift, the duration will round to the nearest 15 minutes. To edit a time entry’s information, you can either click the time entry in the graph or list. When clicking the time entry in the list, a modal will appear and offer a few additional properties, like specifying whether a time entry is billable or not. If an entire project is unbillable, you can specify that in the project form. If, however, a specific entry is unbillable, you can click the entry in the list, then deselect the billable checkbox. In the graph, unbillable time entries will appear as an outline, so you can easily distinguish them from billable time entries. When importing time entries into an invoice, Cushion will automatically filter out unbillable entries.